The importance of landscape heterogeneity to biodiversity may depend on the size of the geographic range of species, which in turn can reflect species traits (such as habitat generalization) and the effects of historical and contemporary land covers. We used nationwide bird survey data from Japan, where heterogeneous landscapes predominate, to test the hypothesis that wide-ranging species are positively associated with landscape heterogeneity in terms of species richness and abundance, whereas narrow-ranging species are positively associated with landscape homogeneity in the form of either open or forest habitats. We used simultaneous autoregressive models to explore the effects of climate, evapotranspiration, and landscape heterogeneity on the richness and abundance of breeding land-bird species. The richness of wide-ranging species and the total species richness were highest in heterogeneous landscapes, where many wide-ranging species showed the highest abundance. In contrast, the richness of narrow-ranging species was not highest in heterogeneous landscapes; most of those species were abundant in either open or forest landscapes. Moreover, in open landscapes, narrow-ranging species increased their species richness with decreasing temperature. These results indicate that heterogeneous landscapes are associated with rich bird diversity but that most narrow-ranging species prefer homogeneous landscapes—particularly open habitats in colder regions, where grasslands have historically predominated. There is a need to reassess the generality of the heterogeneity-biodiversity relationship, with attention to the characteristics of species assemblages determined by environments at large spatiotemporal scales. Figure 5. 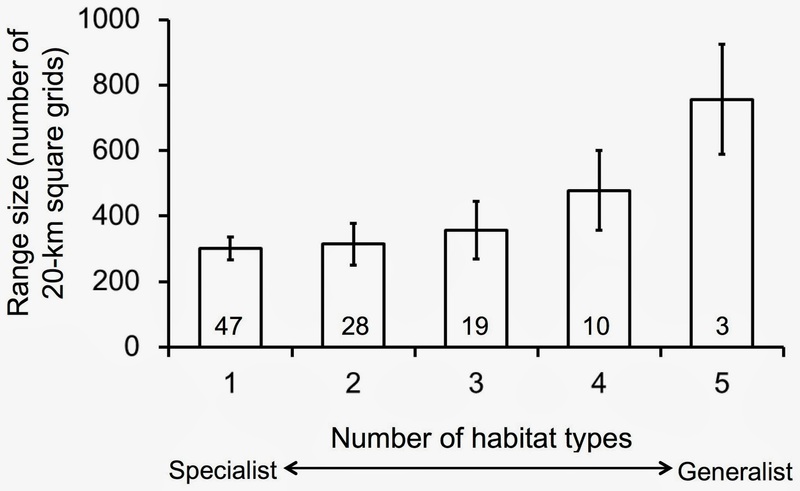 Relationship between number of habitat types used by a species and range size. For range size, the number of 20-km-square grids occupied by the species is used for 107 out of 113 terrestrial bird species in Japan (except for six raptor species without range-size data). Values inside bars and error bars indicate sample size and standard error, respectively. The authors conclude that there are a number of variables at work in defining the solution to ensuring biodiversity in bird populations. For each type of population, specialist to generalist, there would need to be an inspection of the range of habitat used. This would not only be the geographical location but also the local climate too, and possibly other factors of the macro-environment.